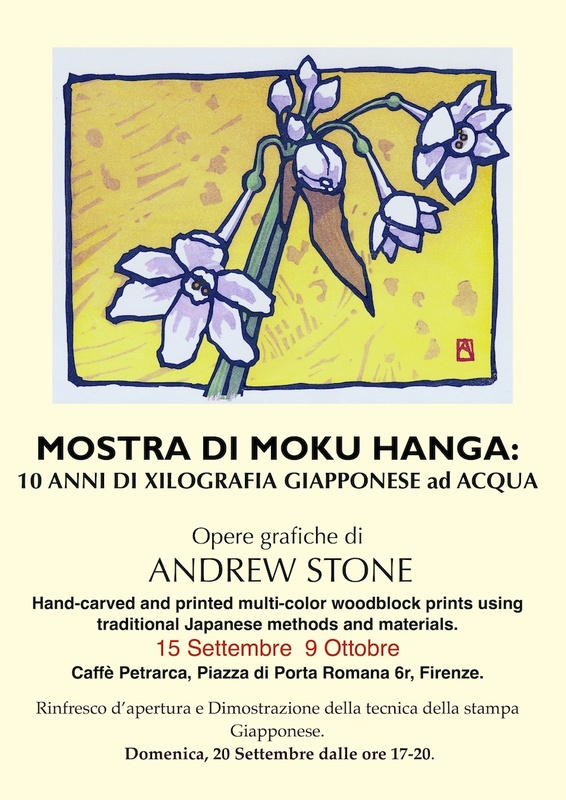 LACRIME Di ROSPO: Show and Tell: 10 Years of Woodblock prints--Caffe` Petrarca Exhibit and Demo. 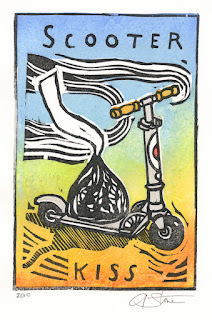 Show and Tell: 10 Years of Woodblock prints--Caffe` Petrarca Exhibit and Demo. I'm exhibiting a good selection of my moku hanga wood block prints for the next three weeks in Florence. The local bar and caffe`, Caffe` Petrarca has two large rooms and hosts regular exhibits by local artists. There is a brisk morning crowd. (Coffee and Pastries) and a very busy lunch crowd...it's popular with the businessmen and women from the local banks and offices as well as students from the Art School across the street. Caffe` Petrarca is closed Saturdays, but open other days from 6am-8pm. "It's sort of like a Bacio Perugina, only without the hazelnut, and made with inferior chocolate, but it has a similar foil wrapper and the little paper poem or phrase. They're very popular and often found in offices and school candy jars all over the US. The scooter? Well, no there is no real reason it's riding a scooter other than silly foolishness....."
Hi Andrew! Makes me want to fly to Florence to see your show! 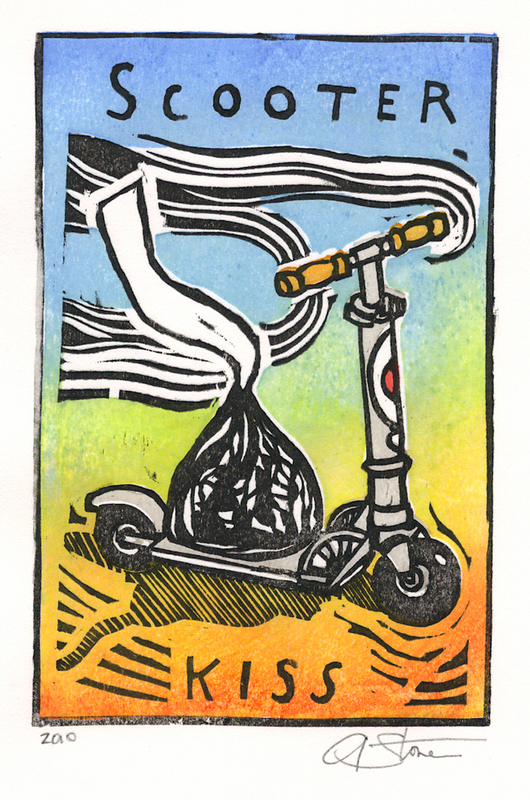 I've always loved your Scooter Kiss. I spent a summer in Perugia during college and ate lots of Bacios! Hi Louise. You would have been most welcome. I had an American come to the opening and demo from Ontario and I gave her your name. She was looking for artists or classes in moku hanga in her area. Thanks for the moral support! Or maybe, since she lives in Ontario, she is Canadian...?